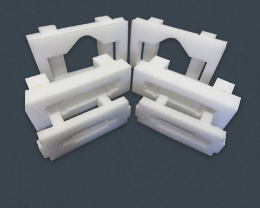 Cut Polyethylene Foam Parts - Polyethylene Foam Fabrication | Foamcraft USA, LLC. Foamcraft USA fabricates polyethylene foam parts. Polyethylene foam is a semi-rigid, closed cell expanded foam material in plain, anti-static, and cross-linked polyethylene foam, including VOLARA®. Polyethylene foam is known for its use in packaging delicate and heavy products when breakage is not an option and polyurethane foam is too lightweight. If engineered properly, it offers multiple impact protection for any set of drop heights, weights and G-force (rate of deceleration) combinations. Polyethylene foam offer a variety of advantages. This closed cell material is tough and energy-absorbent as well as lightweight. Due to its moisture and chemical resistance, this foam will not mold or rot. It is also very easy to fabricate, so is a cost-effective option for your application. Our staff knows how to engineer these materials to their fullest potential to eliminate breakage of your important products during handling or shipping.